IITA, which coordinates the Green Innovation Centre for Agriculture and Food Sector (PROSICA), organized a field day and graduation ceremony in Ngomedzap in the Nyong and So’o division last December 2017. During the ceremony, farming equipment like boots, cutlasses, wheelbarrows, and overalls were handed to some 12 farmers of the Ngomedzap SOCOPROCAON cooperative, who had successfully undergone training in modern techniques of cocoa cultivation in the locality, within the framework of the Farmers Field school (FFS). The farmers were trained to help train other farmers propagate good cocoa farming practices. 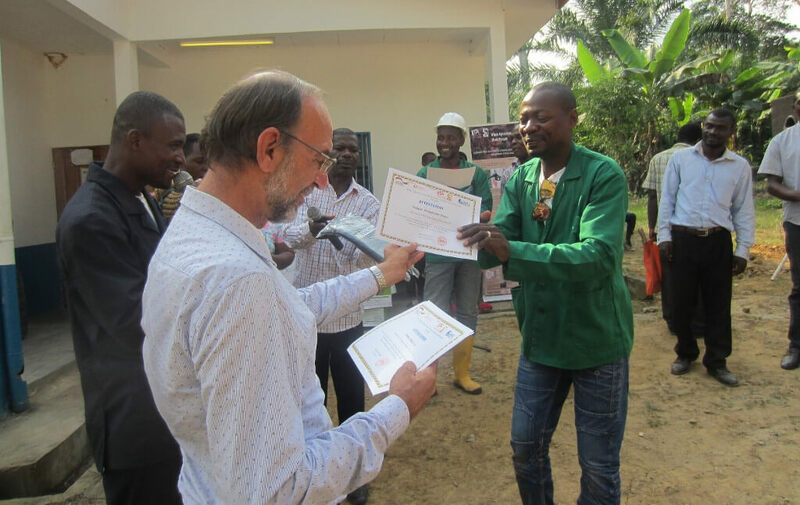 A farmer receiving a certificate during the graduation after a series of farmers field school training by PROSICA in Cameroon. Participants included the Divisional Officer and the Mayor of Ngomedzap, representatives from MINADER, GIZ, IITA, and farmers from the region. Farmers who went through the training were given the opportunity to share their experiences, lessons learnt, and challenges faced while at the FFS. Some of the farmers have quickly adopted new techniques and had gone ahead to clear old cocoa plantations to create new farms that align with the intercropping, spacing, and practical application of other practices taught in the training. Intercropping is the most popular among cocoa farmers from the training because they can get food from the field as the cocoa continues to mature. 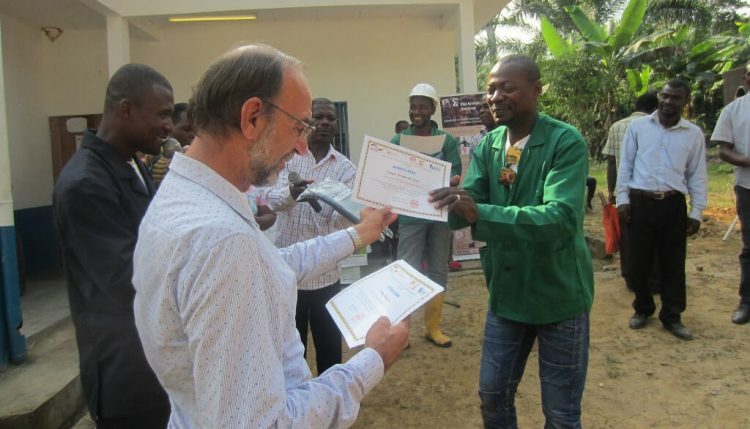 PROSICA has been carrying out similar training activities across Cameroon working with farmers’ groups and cooperatives. Some of the groups that have benefited from PROSICA training include MAUCUP, a Union of cooperatives in Muyuka, and CONAFCOOP cooperative in Konye—all based in the Southwest Region of Cameroon; and Cacao + cooperative in Ayos and SOCOPROCAON Cooperative in Ngomedzap situated in Central Cameroon.